Published: Apr 12, 2016 · Modified: Apr 12, 2019 · By Jen Sobjack · This post may contain affiliate links. 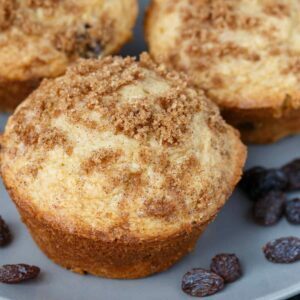 The most delicious Cinnamon Raisin Muffins EVER! 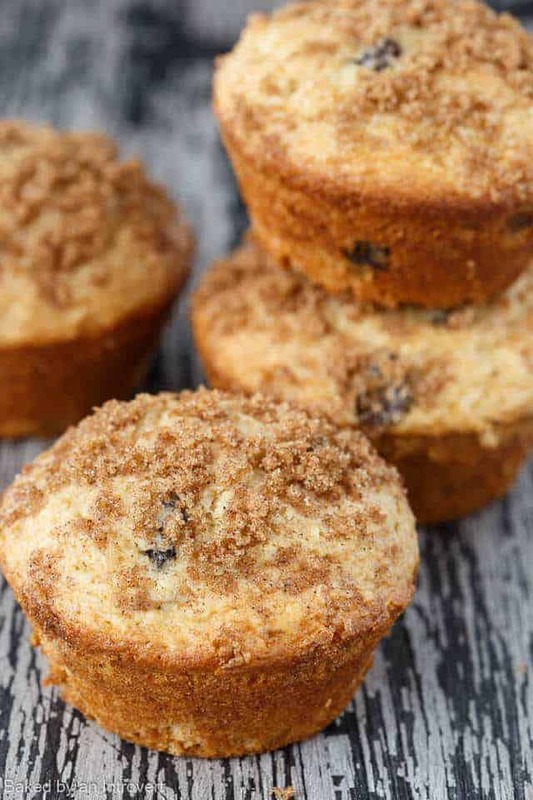 These muffins are light, moist, speckled with raisins, and topped with cinnamon-sugar. They are quick and easy to make, so you can enjoy them whenever the urge strikes! This recipe is an old recipe from the blog that has been updated. 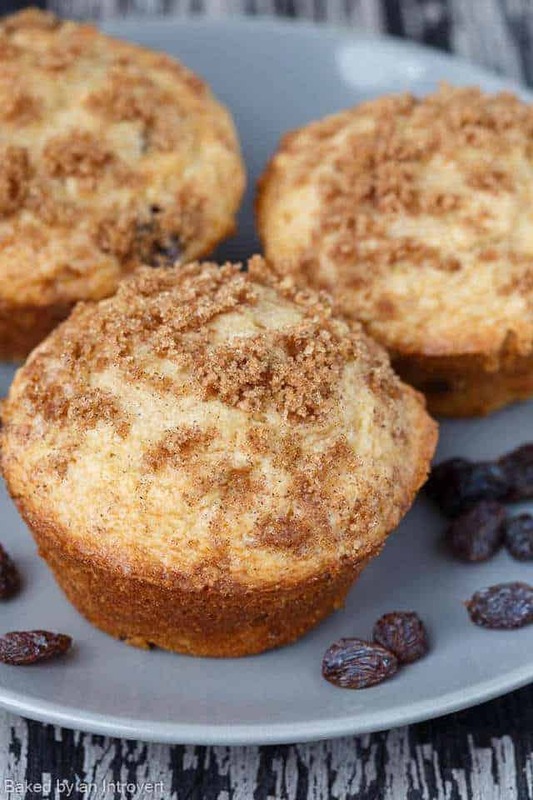 The muffins are spiced with cinnamon and loaded with plump raisins. The great thing about this recipe is you can use any dried fruit you like. The trick to getting puffy tops on the muffins is to work fast! Get them into the oven as quickly as possible after mixing the batter. This recipe is another one that has lived on the blog since 2014. Since first sharing this recipe, I have continued to test and tweak it until I finally got the perfect muffin. Yep, I’m finally happy with the result. And the updated recipe is much, much better than before! It’s up there with my lemon blueberry muffins now. This is the cinnamon raisin muffin of your dreams. It’s buttery and tender. It is loaded with plump raisins. And the extra cinnamon sugar over the top takes it to another level. When working with muffins, it is best to work quickly. Once you mix the wet and dry ingredients together, the baking powder begins to react. This means you can’t waste any time getting those muffins into the oven. Otherwise, you risk having muffins without the well-loved muffin top. Also, to keep the raisins super plump, they need to be soaked in boiling water for about 10 minutes before adding them to the muffin batter. Do this step first, before you even begin mixing the batter. Drain the raisins well after their 10-minute spa and they are ready to be used. The most delicious Cinnamon Raisin Muffins EVER! 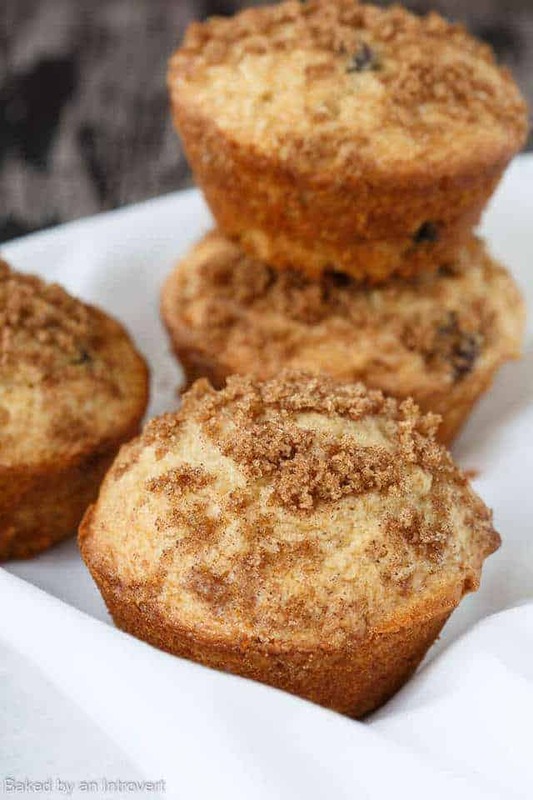 These muffins are light, moist, speckled with raisins, and topped with cinnamon sugar streusel. The are quick and easy to make, so you can enjoy them whenever the urge strikes! Hi there, Saturday morning, my grandaughter around for the weekend. I’ve decided to prepare muffins for breakfast. Never prepared sweet muffins before, only the savory ones. Tried your recipe… we just loved it!! Amazing!! PS. Sorry for my English, I am a Brazilian and my first language is Portuguese. Just tried your raisin muffin recipe and they are like WOW !! Only one problem if you have one your gonna want more, thank you so much for sharing your recipe with us it’s definitely a keeper !! So happy to hear this! Enjoy! I added 1 teaspon of mixed spice and used brown sugar instead of light brown. (Using what i had) Tastes fantastic! Whoa!!! I just made these and they are delicious!! Thank you for a great recipe with thoughtful explanations! It was my first time making muffins, ever, and you recipe helped me figure it out. I don’t usually comment on food but these where a big hit, we all loved them. I did soak the raisins in rum just a personal preference. Just wanted to say thank you, thank you, thank you!!! For the recipe to THE BEST MUFFINS I have ever ate!! I couldn’t believe I made them! DELICIOUS! Just made these and they were delicious! I added one small chopped cooking Apple from my garden and it worked perfectly. Thank you for the recipe. Apple sounds like a wonderful addition! Yum! I’m a big fan of cinnamon and raisin! You’d really enjoy these muffins! I know there are raisin haters out there, but we all LOVE raisins here so I know these would be a hit! Oh my goodness, these muffins do look perfect! I love anything with cinnamon and raisin too, it’s such a great combination. Thank you, Danielle! We adore raisins!! These muffins look gorgeous! Great combination, will definitely try them! Thank you, Mira! We really enjoyed them! These look absolutely comforting. Love the creativity of this recipe. I seriously just want to grab ALL of these muffin beauties out of my screen! These are beyond gorgeous, Jen and I LOVE all that cinnamon sugary + raisin goodness! Can’t wait to give these a try! Thanks, Sarah! I hope you do get to make them! The only time when you actually WANT a muffin top! Hah hah! Actually, I had no idea about working quickly when baking muffins. You are SUCH a great baker, Jen. And I want to dive into a plate of these muffins. They sound perrrrfect. For real! There are actually times when a muffin top isn’t such a bad thing!! good luck with the move Jen, hope everything goes well! The muffins look great, too bad baking at a high temperature didn’t work for you..It always works for me. Pinning this! These muffins look great, I love the streusel topping. And cinnamon and raisins is always good! Good luck with the move, hope everything goes smoothly for you! Yay, congrats and good luck with the move, Jen! Hope everything goes smoothly and you guys are enjoying your new house 🙂 Love these muffins, they look positively amazing especially with all that streusel! CONGRATS on the move! Sending great vibes your way that all your pretty things arrive safely! I love the flavor of these muffins, Jen! Sounds delicious! And I actually bake most of my muffins at 425F for 5 minutes, and then decrease the temp to 375 and they usually turn out nice and fluffy! That’s too bad that it didn’t work out to your expectations, but they still look incredible! It could have been my oven. I plan on testing it out again with my new oven. Fingers crossed for better results next time. Thanks Erin! We’ve been working non stop to get settled in. We’re almost done. Yes! I need a support group for my streusel addiction, hahaha.